Import/Export product attributes all properties like attribute code, attribute label, attribute set, attribute group etc. Create attribute group and attribute set name automatically. 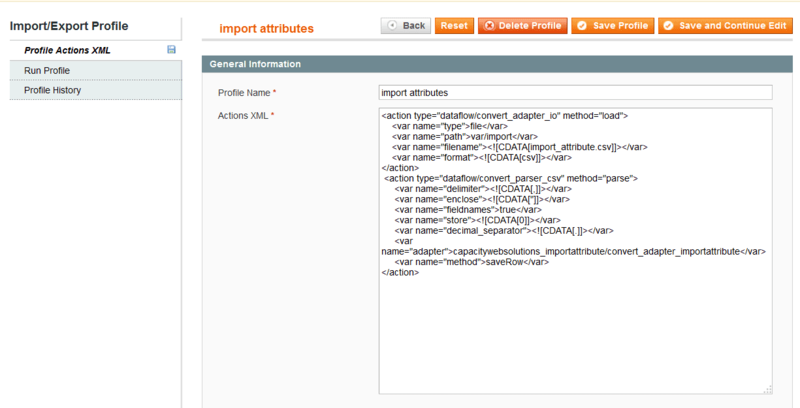 Our import export product attributes extension create new attribute values if it does not already exist in your store. Create attribute label store view wise. Create attribute option store view wise. All types of catalog input supported by this extension. This extension will import/export products attributes, attribute sets and attribute groups. You can import/export any type of attribute and all associate attribute values as well as the attribute options themselves. You can Import/export Multiple Attribute Set. Steps For Import Product Attributes. 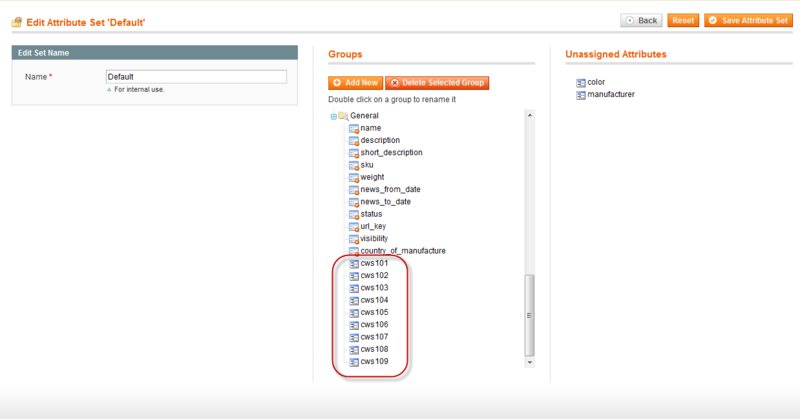 1) Upload "import_attribute.csv" File in your Magento_Root/var/import folder. 4) Go To System >> Import/Export >> Dataflow – Advance Profiles Sections. 5) Click On Import attributes then you will get Following Screen. 6) Click on "Run Profile" tab (From left Navigation).You will get Following Screen. 7) Click on "Run Profile in Popup" Button.You will get Following Screen. 8) Now successfully Imported Product attributes. Now, you can check "Attributes >> Manage Attributes" page. Steps For Export Product Attributes. 4) Click On Export attributes then you will get Following Screen. 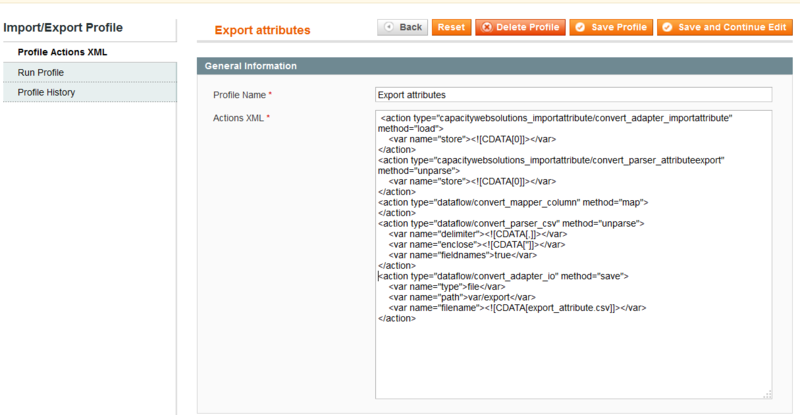 7) Now Product attributes exported successfully.You can get "export_attriobutes.csv" file in Magento-Root/var/export/file . This extension does precisely as it describes.When I had a little issue, customer support quickly settled for me. Quick help! Quick and easy to install Magento Import Export Products Attributes Extension from MageBees. Follow the document and use it. Manage to import 5000+ products. Its save my time. I bought this module after I used a free one. The difference is from the ground to sky. I managed to import my attributes in 15 minutes after the instalation of the module. I highly recommand the module. Also the support team was great. I asked some questions before starting to use the module and they offered very usefull answers in a very short time. I used to augmentation to exchange attributes starting with one store then onto the next and it functioned admirably. This expansion works extraordinary for what I required. I should have been ready to export and import my attributes and values.When you send out, you basically need to ensure you open up the documents read it and follow it. Extremely decent augmentation, simply need to comprehend the direction and easy to use. Easy to use and worked perfectly. We needed to export the attributes from one Magento site to an upgrade. Installed and executed the export, then the import and they showed up perfectly. Highly recommend when you have this tedious task to complete, will save you a lot of time, particularly if you've got a ton of attributes and sets. Works with Existing Attribute Set. You can create new attribute set based on existing attribute set. .
Our extension Works with Security Patches. Fixed attribute group sort order issue. Also do some require modification into documentation. Q-1 :I click on "Run Profile in Popup in" in Import Attribute Section then I get the following error Could Not Load file: "...\...\var\import\import_attribute.csv". Ans : This error showing that "import_attribute.csv" not properly upload So Please upload "import_attribute.csv" File in your/var/import folder. Ans : This error showing that "import_attribute.csv" not properly created (Due to store view id Wrong Created in store_label or Storeview_option) So Please assign true Store View id.